Cycling is heavily involved here so, naturally, what goes around will come around. 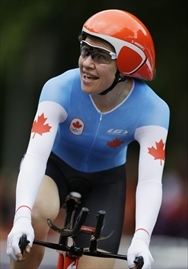 Clara Hughes wants the best for everyone and — so the wheel turns — everyone wants the best for her. She will be honoured with a monument at the top of the hill called Sydenham Road where, from 1991 to ’98, she pushed her sinews and lactic-acid toleration to the threshold on her way to becoming the only person in history to win multiple medals in both the Summer and Winter Olympic Games. It will be a little more leisurely this time as she’ll join kids from a local cycling club for a commemorative ride up the hill Saturday morning as part of the unveiling of Clara’s Climb, the monument that will celebrate her seven years living in Dundas and Hamilton, her six Olympic medals in cycling and speed skating and her humanitarian efforts around the world. Hughes, who turned 40 soon after retiring from Olympic sport following the London Games, remains an impossibly busy and giving woman. This is only a partial list of the noble causes to which she is fully committed: She’s a spokesperson for Let’s Talk, the Bell Canada initiative to remove mental-health issues (she has suffered depression) from the shadows; she is one of the most proactive members of Right to Play, the athlete-based charity that empowers children around the world: she is deeply involved with and supportive of the Inuit on the east arm of Great Slave Lake, where a new national park is close to being completed; and she donated her $10,000 medal bonus from the 2010 Olympics to Take a Hike, a Vancouver organization that reaches children at risk through outdoor programs. In fact, she’ll be donating her appearance fee from Friday’s Speakers Series at Mohawk College to Take a Hike. There is no one like her, never has been anyone like her, in Canadian sport and she cannot envision not contributing to the greater community. Ever. While Hughes transcends sport, she embodies the attributes the rest of the world sees as Canada’s genetic cultural core. She’s accessible, determined, warm, industrious, accomplished, looks hardships in the eye, smiles in megawatts and cares deeply about her fellow humans. “I’ve travelled with sports for over 20 years and it gives you a perspective from around the world of what Canada is,” she says. “It’s the idea of giving back, of fighting for things, of protection, of making change. “All the coaching I got over the years, all the help, it was all by volunteers and, as I matured and developed, I realized these things don’t just happen … they MAKE them happen. “During the Vancouver Olympics, that’s what I liked about Canadians, the volunteering. It’s part of our DNA, part of our makeup, to give back. It’s an ideal I love and I want to live up to. While Hughes is one of the most positive people you could ever encounter, she is no Pollyanna. Her life has not always been easy, her vision not always clear. By her own admission, she was headed down the wrong path until speed skating, when she was 16, and cycling, at 17, altered the direction. And, a couple of years ago, hoping it would help others, she revealed through her close friend, the late Randy Starkman of the Toronto Star, that she was battling depression. That was why it was Maureen Hughes, not Clara, who was in Hamilton in early 2007 to accept the 2006 Golden Horseshoe Athlete of the Year award. “It was right then that I was going through a very rough time,” she recalls. “I was depressed, wondering how I was going to continue in sport. It seemed very bleak and it was really a dark time for me. I really couldn’t come to accept the award. “But I’m not afraid to talk about it. To let people know that they’re not alone. “I’ve won a lot of races, a lot of Olympic medals, but every medal stands for something. Something you overcome, or battle through.